Silvera, Adam. 2015. More Happy Than Not. New York: Soho Teen. A new memory-relief institute has opened in the Bronx, and trauma victims, grieving parents, and schizophrenics are finally able to achieve respite from troubling memories. Aaron Soto is skeptical of a miracle treatment center serving the projects, but he has seen the procedure work for a friend. Even so, it doesn’t seem like a great idea. Aaron’s had some challenges in his life, but he wouldn’t want to erase his memories. His life has been hard—his father recently committed suicide, his family is impoverished, he doesn’t see his mother much because she works two jobs, and his friends are not particularly supportive. Still, there are shining moments. He has a sympathetic girlfriend, an engrossing comic art hobby, and it’s a great summer for outdoor games. When he meets a new kid named Thomas, his life suddenly gets a lot better. Aaron has never been able to talk to someone with such openness and vulnerability. Thomas gets him and doesn’t avoid hard topics like his father’s death. Besides that, they have a lot of fun together. Aaron finally has someone to talk to about comics and fantasy novels, and Thomas tells him all about films he likes. The two get closer and closer and Aaron gradually realizes that he’s falling for Thomas. His relationship with his girlfriend is a platonic farce and he can’t stop thinking about how much he cares for Thomas. But being gay is not such a good thing in his neighborhood. Masculinity is very important to his working class friends, and effeminacy and gayness are mocked and feared. Aaron starts to think maybe it would be better to preserve his friendships and reputation by having the memory-relief procedure to forget these inappropriate feelings. More Happy Than Not stayed with me for a long time after I finished it. It’s not often that I’m so emotionally affected by fiction. The character development and dialog in this book are so excellent and authentic, I really felt that I knew Aaron, and I liked him. I wanted him to be happy, and it was heartbreaking that he was afraid to be gay. The thing is, Aaron’s reality is very real. In communities like his, being gay is not celebrated and coming out can be terrifying. This is an upsetting read, but it’s important that these stories are told. 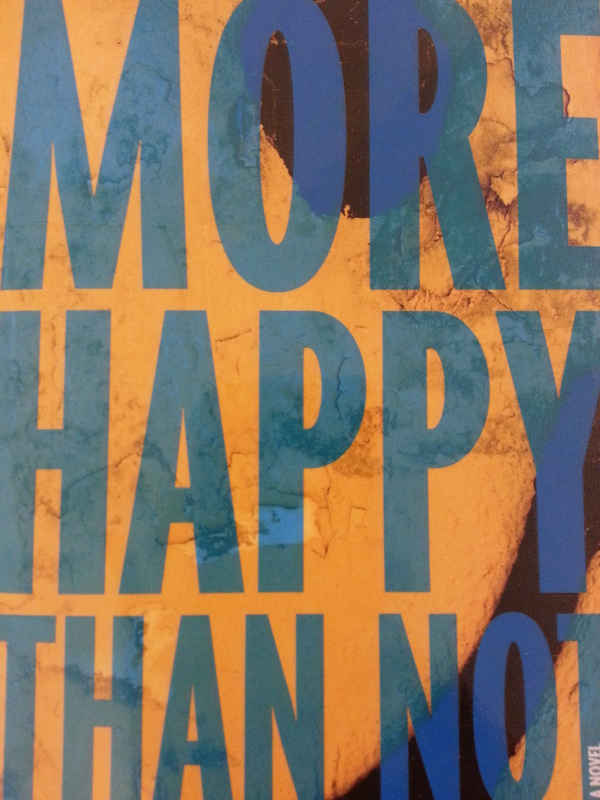 More Happy Than Not was on the 2016 Rainbow List and received starred reviews from School Library Journal, Kirkus, and others. Content notes: Graphic scenes of homophobic violence and father’s suicide. This entry was posted in Fiction and tagged Coming Out, Gay, Gay Men, High School Audience, LCSH Coming out (Sexual orientation)—Fiction, LCSH Dating (Social customs)—Fiction, LCSH Gays—Fiction, LCSH Memory—Fiction, Puerto Rican, Science Fiction, Speculative Fiction, Working Class, Young Adult Audience. Bookmark the permalink.